Nebraska football fans have been looking forward to the new year even more than usual with the firing of Bo Pelini and the hiring of Mike Riley. So as a new year dawns, it’s a good time to look forward and see what kind of resolutions for 2015 would help move things forward and make things better for the Cornhuskers. Here are five to consider—and hopefully keep in place longer than the two weeks my “do sit-ups every night” resolution is likely to survive. The first thing Riley has to do is help protect and preserve Nebraska’s 2015 recruiting class. The dismissal of Pelini has already cost Nebraska standout running back prospect Kendall Bussey, although there was always some question as to whether Nebraska could have kept him even if Pelini stayed. But there are other critical parts of the 2015 recruiting class assembled by Pelini that Riley needs to keep committed to the Big Red. Defensive backs Eric Lee and Avery Anderson, along with the Davis brothers Khalil and Carlos (both defensive tackles) are critical parts of the recruiting class, and Riley’s first priority must be to get their signatures in February. Riley is known for operating a pro-style offense at Oregon State. His most recent quarterback, Sean Mannion, just broke the Pac-12 record for passing yards in a career. While it is not clear what Nebraska’s offense will look like next season (more on that later), it’s a safe bet that Nebraska will be throwing the ball more under Riley. Combine Riley’s talent in developing quarterbacks with the recent hiring of Danny Langsdorf—who was quarterbacks coach for the New York Giants last year—as offensive coordinator suggest the passing game will be a big focus for Nebraska in 2015. Tommy Armstrong will be the incumbent coming into next year, but he will also be bringing in a 53 percent completion rating. Behind him will be Johnny Stanton, who Riley tried very hard to get to Corvallis, along with unknown quantities in Ryker Fife, Zack Darlington, and A.J. Bush. Riley and his staff will have this offseason to see what they have to work with as Nebraska’s signal-caller for 2015. Yes, Riley is known as running a pro-style offense. But there is no question that Nebraska does not have a pro-style collection of talent. Nebraska fans are scarred with the memory of a new coach trying to shoehorn a quarterback into a system that does not fit his skill set (see Dailey, Joe). So while Riley will be tasked with installing his system in Lincoln, he will also need to make sure he takes into account the talent on his roster when developing his game plan. This one’s not for Riley, it’s for Nebraska fans. While the goodbye speech helped turned public opinion against Pelini, the fact remains that Riley is taking over for a coach that never won fewer than nine games. Nebraska opens next year against BYU, South Alabama (who played in a bowl game) and at Miami. 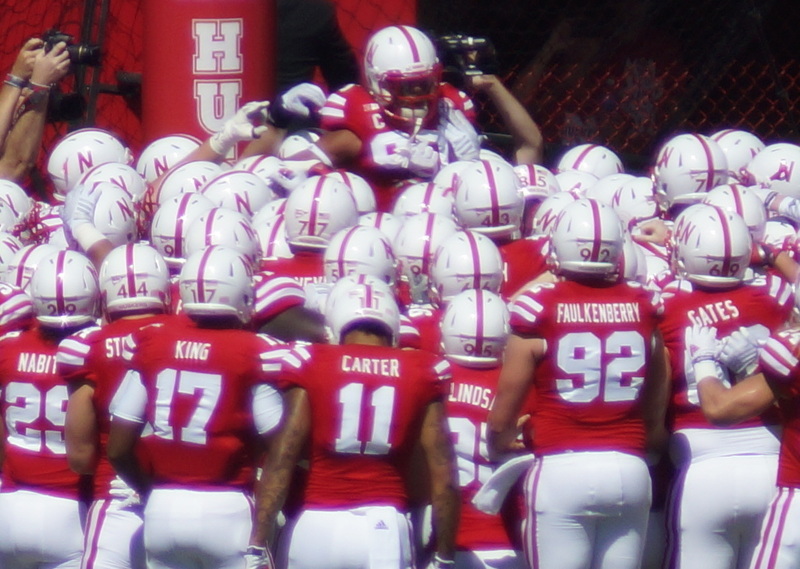 While unlikely, it’s not inconceivable that Nebraska could start 2015 at 1-2. If that happens, Nebraska fans need to take some advice from Aaron Rodgers. R-E-L-A-X. Transitions take time, and there are bumps in the road. While I don’t think it’s likely, it’s not at all inconceivable that Nebraska’s record could end up worse in 2015 than it did in 2014. So if that does happen, Nebraska fan, take a step back. Much like the record in and of itself didn’t tell the whole story about the Pelini era, the record in and of itself won’t tell the whole story about Riley’s first season. Certainly Riley isn’t above criticism, but judge Nebraska’s performance in year one of the Riley era on performances, not just results. I know, I’m sick of hearing this song too. But it’s good advice, particularly for Nebraska’s returning players. Pelini did a lot of good things about creating a family atmosphere around his team. But one of his primary motivating tactics was creating an “us-against-the-world” mentality, and his goodbye address made it very clear that Pelini thought Nebraska’s administration (as opposed to Pelini) was responsible for NU’s struggles and his own dismissal. Of course, he’s entitled to that opinion. But by explicitly telling that to his players—right after his firing, when they were angry and emotionally vulnerable—Pelini set all kinds of psychological land mines in place that could go off when Nebraska faces adversity next season. Ultimately, it will be up to the players next year—and specifically to the senior leaders that arise on the team—to flush that kind of victimization and make sure the team remains accountable to itself and avoid the easy-out scapegoating that looked to consume it at times under Pelini.